Progressive International� is your source for the widest range of functional, inventive, and fun kitchen tools and great ideas put into practice. Our in-house designers spend hours in the kitchen coming up with ways to improve on a variety of traditional tasks and tools. Established in 1973, our commitment to quality and service allows us to offer a broad selection of quality kitchenware and other household products. This 1 cup capacity citrus juicer is designed to fit limes, lemons and oranges. 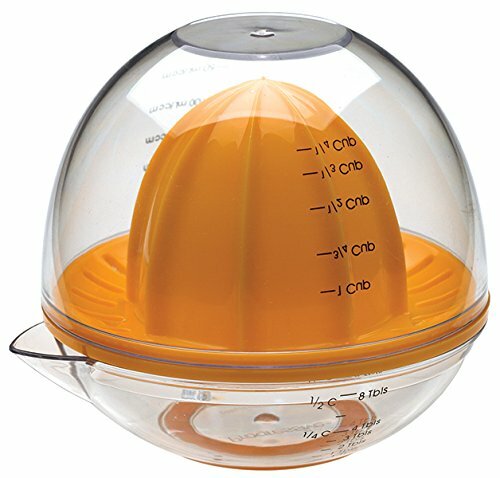 This juicer features a domed lid that doubles as a measuring cup and has a non skid base so it won’t easily move. It includes printed measurements in tablespoons, cups and millimeters and is made of heavy duty plastic. Dishwasher safe.